SEIU says it's pushing a ballot measure that would move city elections from June to November in order to increase voter participation. But is the move also about payback to the council for wage cuts? 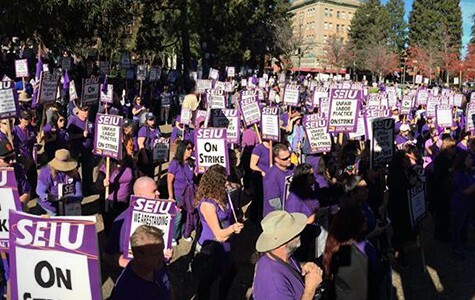 The SEIU Local 1021 is seeking a ballot initiative next year for a charter amendment that would move Hayward's mayoral and city council elections from June to November when voters typically vote in far larger numbers. In 2014, after Mark Salinas lost by just 735 votes his bid to jump from the Hayward City Council to the mayor's office, he lamented the lack of voter participation in Hayward. "We have to be more aware about local issues, local politics, and we have to be more aware of the impact our local elected officials have in our everyday quality of life," Salinas wrote at the time in a letter to supporters. The Service Employees International Union (SEIU) Local 1021 — which has strongly opposed Salinas ever since his vote in 2013 to impose wage cuts on workers in the City of Hayward — agrees. The union is seeking a ballot initiative next year for a charter amendment that would move Hayward's mayoral and city council elections from June to November when voters typically vote in far larger numbers. Hayward has held its mayoral and city council elections in June since 1994 when voters approved an initiative to align their elections with the June primary schedule. Most political observers agree that low-voter turnout in Hayward is a serious problem. In recent election cycles, its electorate has consistently registered some of the worst turnout numbers in Alameda County. During the June 2012 election, just 28 percent of Hayward's registered voters went to the polls. Overall, county participation was 32 percent in that election. Later, in the November 2012 presidential election, which typically attracts substantial attention, Hayward's turnout was 69 percent, but still less than the 74 percent average countywide. "There's a broad movement in municipal circles to move their election cycles when more is going on," said Jim Ross, a veteran Bay Area consultant, who is a spokesperson for the Hayward Votes Together campaign. Oakland and Berkeley both hold their mayoral and city council elections in November, when more voters tend to vote. In addition, Ross said "a broader goal" of the campaign in Hayward "is to create a situation where we have a city council that is more reflective of the city." The Alameda County Democratic Party is also seeking to increase voter participation. In recent weeks, the party deployed volunteers to register new voters in Hayward. But Salinas, who is again a candidate for the city council in 2016, is skeptical of the proposed charter amendment, despite his previous call for greater voter participation. He echoed a concern offered by other elected officials that Hayward's local elections will be crowded out by highly publicized state and national campaigns. "I prefer flexibility in June," said Hayward Mayor Barbara Halliday, who beat Salinas in 2014, while garnering just 4,897 total votes in a city of more than 150,000 people. "I think city elections will get lost in November." Ross said this line of thinking is false and numerous studies show presidential elections "drive interest all the way down the ballot." In play in Hayward is an oft-cited rule of thumb in politics that low turnout greatly favors incumbents. The existence of a union-backed initiative to stoke voter participation may be unsettling to the status quo in Hayward even though its passage will have no effect until 2018. "There's nothing for them to be afraid of. By the time the changes are implemented, most will have moved along," said Ross. Yet there is much mistrust on each side. Since the council's move following a lengthy contract dispute with city employees to force 5- percent salary cuts on SEIU Local 1021's members two years ago, the relationship between the union and elected officials has been icy — despite the fact that the two sides finally agreed to a new contract earlier this year that was fairly generous to workers. As pushback to the council's action in 2013, SEIU Local 1021 spent more than $120,000 to support two labor-friendly candidates during the June 2014 council election. The large outlay for Hayward politics shocked many City Hall observers and resulted in one of the labor-backed candidates — Sara Lamnin — winning a seat. The council, however, with four of its seven members up for re-election next June, is not sitting idle when it comes to election reforms. In November, it approved a municipal election ordinance requiring candidates in the June election to disclose their top four campaign donors, along with amounts and city of origin on mailers and other related paraphernalia. While good government advocates welcomed the ordinance, its impetus was SEIU Local 1021's large independent expenditure in the 2014 election. "Elections are becoming more and more expensive," said Councilmember Marvin Peixoto, while referencing the expensive East Bay state Senate race last May between Steve Glazer and Susan Bonilla in which special interests spent more than $7 million. "That's too much for a campaign and it's not democracy," said Peixoto.